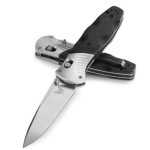 If you’re looking for a big and sturdy folding knife, then the Benchmade 741 Onslaught fits the bill. This is a massive knife that’s perfect for tactical and defensive uses, but it’s still portable enough to be carried around for menial tasks if you like larger blades. Perhaps the most striking thing about the Onslaught is the blade size. 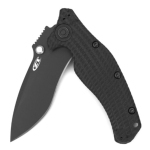 At nearly 4.3 inches, this is a blade that will intimidate attackers while also coming in useful for larger tasks. The handle is about 5.5 inches, which brings the total open length to nearly 10 inches. The handle has an ergonomic design that makes it easy to wield and handle. Some people may like the weight, which clocks in at 6.8 ounces, but others may find it a little too heavy. This comes down to personal opinion, but it helps provide a sturdy knife that is versatile and durable. Most big knives have a thick blade, which increases strength but tends to reduce the blade’s cutting ability. The Onslaught differentiates itself by using a thin stock that makes it ideal for cutting and slicing. Aside from tactical uses, many use this as a skinning knife while hunting. The back of the blade has a smooth, flat grind that makes it comfortable to use and fold. What people love about the blade is the size of its belly. The underside of the knife is huge and ready for cutting anything. Whether you need to cut something small for utility purposes, or if you need to skin a large deer or cow, this large blade will be ready for anything. 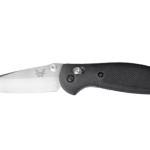 Like with many Benchmade premium products, the Onslaught is made with 154CM steel. This metal is ideal for sharp blades and maintaining edges, and it adds extra strength so that the blade is great for hard work. The only problem with this steel is that it’s a little prone to rusting, but that shouldn’t be an issue if you properly care for the knife. You can choose between black and silver blades. 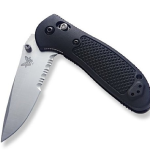 Benchmade is known for making strong blades, but they are just as famous for their patented Axis locking mechanism. 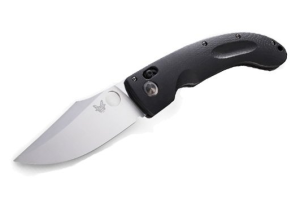 Known for a smooth pivot and a strong lock, Axis makes the blade deployment nearly automatic. It’s hard to get faster than this. It also feels like butter. Nothing gets in the way of the knife deploying. Cheaper knives tend to have some give when the blade is locked, but the Onslaught’s blade won’t move unless you unlatch the locking mechanism. This allows you to put all of your energy behind cutting, not fighting the knife. Another benefit is the ambidextrous nature of the Axis lock. The main mechanism is on the right for a better fit in the right pocket, but it can be easily mounted on the left side. Some people overlook the handle and just focus on the blade, but that’s a little difficult with the Onslaught. Aside from its large size, many take notice of the elegant finish of the handle. Coming in a sleek black and a machined grip, the Onslaught’s handle is considered a work of art. The internal workings have been skeletonized to reduce weight and friction, making the entire knife quite balanced and easy to wield. What might turn some people off initially is the handle’s smooth design. Many pocket knives have a textured design that makes them easier to hold. This type of design is needed with smaller knives because it can be hard to hold them, but the larger handle allows you to get a good grip without additional assistance. You’ll have no problem handling the knife, regardless of the task. 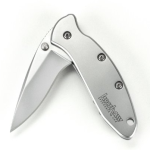 Pocket knives are known for being small and concealable. While the Onslaught isn’t quite small, its unique design still makes it concealable and very easy to wield. The large blade is looked at with awe, and the perfect sharpness makes it ideal for many purposes. Whether you like exquisite knives or just want something for utilitarian needs, the Onslaught doesn’t disappoint. Most people make this their everyday knife, but others seal it away as a collector’s item. In either case, the Onslaught is seen as one of the best large pocket knives.